Whoa! Looks like someone's hair got butchered at the salon again! It's an age-old story...you come in to touch up your roots, and the next thing you know, Becky - who's been your stylist forever - is jamming her shears right into your head. You noticed she wasn't looking the best when you waltzed in a few minutes late - even after she said that she had a tight schedule that day and would only squeeze you on her break in as a favor - but you thought she was just tired from working so hard! Which is why you were late, in the first place...you were actually doing her a favor by stopping at Starbucks real quick to get a latte. After all, who wouldn't love a few minutes of downtime before their next appointment! But she kept mumbling under her breath, and you don't even think she was paying attention when you showed her your Pinterest board of the kind of Bayalage you wanted to her do real quick. Rude! And then before you knew it, she was stumbling around, knocking things over, and before you could say, "Uh, Becky? I'm kind of in a hurry", BAM! 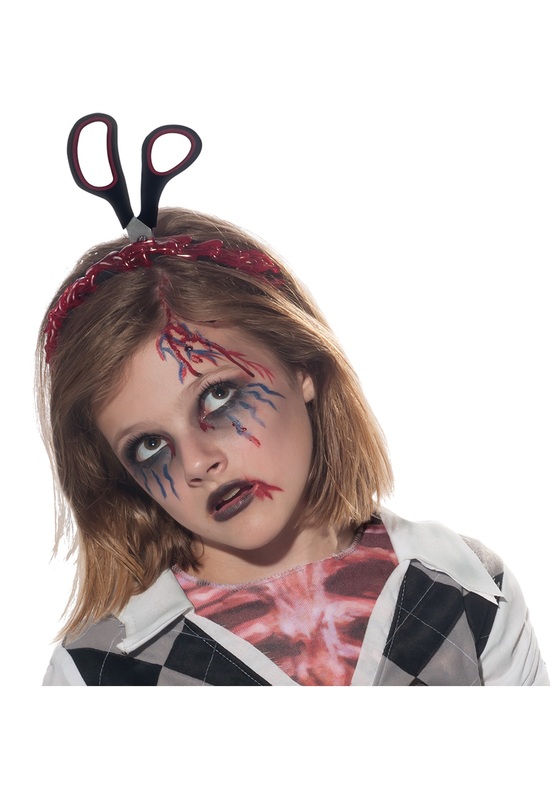 Those scissors were gliding right into your skull, and your hand was being crushed by her obviously-does-not-use-Crest-Whitening-Strips teeth! And now you're totally a zombie, and you don't even get to be the one with the cutest hair. But don't freak out yet! Just pull those roots backs with this Headband with Scissors and Blood, and bam! Problem managed. The headband is in this fall's signature red (even though it's your blood) and the scissors are a total conversation-starter! So yeah, when all is said and done, maybe this whole zombie thing won't be so bad after all? You're lookin' pretty cute, and you just saved some sweet cash, because Becky? Is sooo not getting a tip.